The reorder data for the final week of March are out, and to no one's surprise, Detective Comics #1000 and its many variants took multiple slots on the chart. The top reordered item in dollars, meanwhile, was Savage Sword of Conan: The Marvel Years Omnibus Vol. 1. 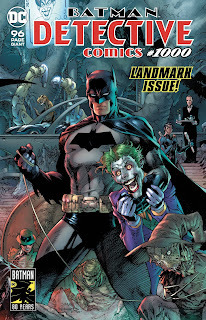 The top reordered comic book apart from Batman was Tim Seeley's Dark Red #1 from Aftershock; the second issue made April's advance reorder chart. See the March charts so far here. The advance reorder chart was led by a variant second printing of Immortal Hulk #16. Star Wars: Galaxy's Edge #1 placed second. See the April charts so far here.